Mark Sanford today took the apology press conference to a whole new level, removing yet another name from the ever-shortening list of 2012 GOP presidential contenders. South Carolina Gov. 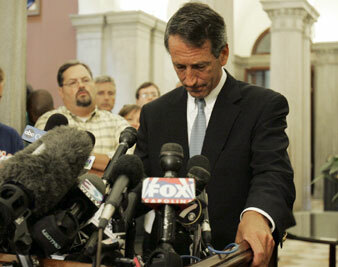 Mark Sanford admits to having an affair during a news conference Wednesday, June 24, 2009. In fact, this has become something of a Republican cottage industry in recent months, as Louisiana Senator David Vitter and Nevada Senator John Ensign have spiced things up by adding prostitutes, staffers and suddenly very well-compensated aides to the mix. But South Carolina Governor Mark Sanford–who, to a far greater extent than Vitter or Ensign, had the ambition and the talent to maybe be a Republican presidential contender–has taken the apology press conference to a new level. None of that old “I’m not going to talk about…” line for Sanford. The governor admitted to just about everything he could admit to in a twenty-minute press conference. Yes, he cheated on his wife. Yes, he lied to his staff. Yes, he lied to the media. Yes, he abandoned his position and ran off to South America to try and sort out his love life. Yes, he thinks that people should be disappointed in him. And, yes, he’s actually taking at least some responsibility for being irresponsible. Sanford is resigning as head of the Republican Governors Association, a traditional stepping-stone position for a presidential run. No word on whether he’s resigning as governor–following the lead of New York Democrat Eliot Spitzer–but it is probably safe to say he won’t be on the ballot, for president, vice president or any other position in the immediate future. The governor, who flew home this morning after a Father’s Day disappearance to Buenos Aires, is finished politically. He might have been finished even if he had merely gone missing on the Appalachian Trail, as his staff had claimed for a few embarrassing days. But flying off to Argentina for a heart-to-heart with the other woman doesn’t play well on the Republican primary circuit. So mark Mark off the list of 2012 prospects. Anyone who watched his poignant press conference–where Sanford eschewed the always agonizing “wife-at -his-side” routine and stood solo before the microphones–had to come away with the sense that this might be all right with the governor. The governor did not scrimp when it came to details. He talked about how long he had known his lady friend in Argentina–eight years. He talked about their tempestuous e-mail relationship and about when things got more “serious.” And through it all–though he was entirely apologetic to his wife and sons… and staff… and constituents… and… and… and…he seemed like a man who is still a little uncertain about romantic entanglements. That’s a good idea, governor. But here’s some advice for the lovelorn: The work of the heart is rarely well performed on the public stage.